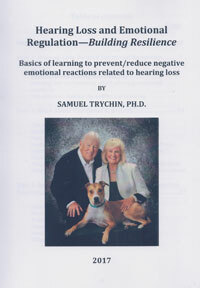 Trychin, S, (2017) Hearing Loss and Emotional Regulation: Building Resilience. Sometimes, communication difficulties result in an emotional reaction such as fear/anxiety or irritation/anger. This can happen when we are unexpectedly caught up in a situation in which understanding is important and we are aware that we are not understanding what is being said. It can also occur when we anticipate difficulties in an upcoming situation that previously has been problematic and uncomfortable. Unfortunately, emotional arousal often interferes with clear thinking, resulting in failure to do what we know would e helpful in preventing or resolving communication difficulties. 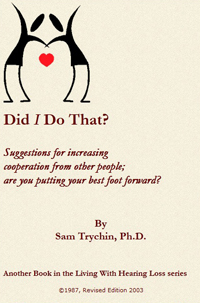 This book contains ways of preventing or reducing emotional reactions in difficult communication situations. Making changes in communication behavior is difficult. This workbook provides exercises known to be helpful in altering communication tactics for the entire family when hearing loss is present. Putting these suggestions into practicing with or without a partner helps in preventing or reducing communication difficulties, resulting in improving relationships as well as increasing understanding what is being said. 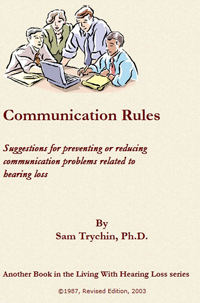 This book and accompanying DVD provide specific examples of what people should do and what they should not do in communication situations in order to prevent communication difficulties related to hearing loss. Reading the scripts in the book and/or seeing actors in the DVD portray communication errors and their correction brings the lessons home in a vivid and concise way. This book covers the types of problems frequently encountered in school situations by students who have hearing loss. The content addresses academic, personal, and social risks for students when their hearing loss is not properly accommodated. 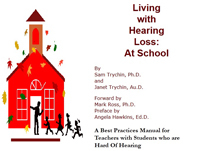 A major focus of the book is on strategies and tactics found helpful in preventing and reducing hearing loss-related problems in classroom settings for both students and teachers. 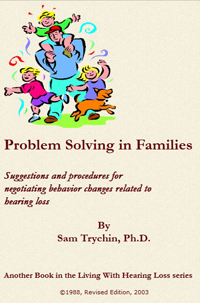 This book examines the kinds of attitudes, thoughts, and beliefs related to hearing loss that often contribute to needless distress for people who have hearing loss and their family members. The book provides suggestions and procedures to change stress-producing and unhelpful thought patterns, and replace them with attitude, thoughts, and beliefs that are more accurate and healthy, leading to more productive functioning and better understanding of what others say. 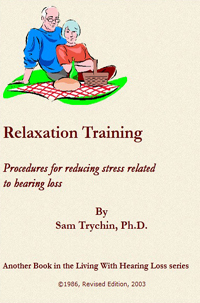 This book and DVD contain information on the benefits of using relaxation skills. The contents provide detailed instruction on controlled breathing and deep muscle relaxation. These well documented procedures help to put the brain-body systems into synchrony, resulting in replenishing health and energy, while increasing a general sense of well-being. When people are calm and relaxed, they are better able to understand what others are saying and think more clearly about what needs to be done in difficult communication situations. 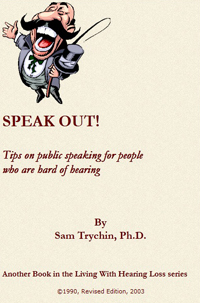 This book contains tips on public speaking for people who have hearing loss. 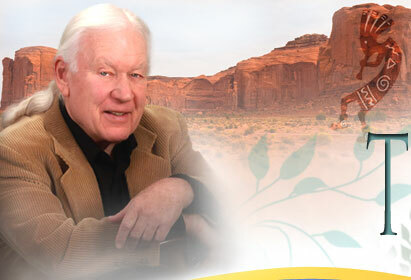 A wealth of information is presented on how to set up the situation such that people who have hearing loss in the audience and the presenter who has hearing loss will all understand what is being said. Strategies and tactics are focused on ensuring that the speaker understands the comments and questions from the audience and the audience understands what the speaker is saying. Valuable information is effectively and efficiently presented to an audience by having actors role-play specific situations. 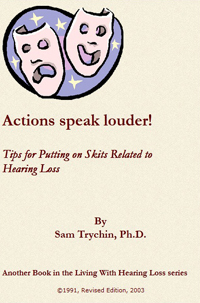 This book contains 21 skits depicting difficult situations reported by people who have hearing loss and/or their communication partners. Much is learned when actors role-play these vignettes before an audience and ask questions about what might be done differently to prevent or reduce the problem(s) shown. The book also includes detailed information on how to develop and portray skits, use props, and generate questions for the audience. 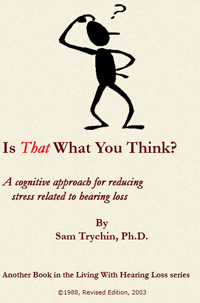 Contact Dr. Trychin at samueltrychin@gmail.com or by phoning (814)897-1194. 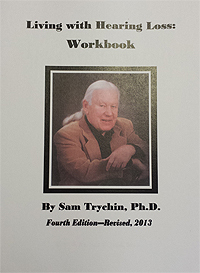 Mailing address is Sam Trychin, Ph.D., 212 Cambridge Road, Erie, PA., 16511.